This summer presents some of the most extraordinary astrology. There's a powerful harmonic resonance surrounding this solstice, leading us toward the potential for greater shifts and changes. Of course, as powerful and impressive as it all is--nothing will come of its own accord. We must navigate this passage consciously, and remain open and receptive to the coming influx to ultimately allow for change to take place. In the northern latitudes, the Summer solstice is the longest day of the year; the sun reaches the highest point in the sky. This high point is symbolic of a fulcrum of energy potential and a sprouting of intentions planted at the Spring equinox. The Sun beams from this sky-born pedestal--pouring light, heat, and energy upon us--and because the Sun is symbolic of consciousness, the full expression of ego (the self, as in the I am), there is a blossoming of personality, individuality, and often a high point for the mind. As the Sun enters Cancer there is a greater fascination with the deeper realms of the mind--the subtle diaphanous images and visions that float like wisps of smoke upon the inner eye, the realm of imagination. We all daydream from time to time, often wishing for some alternative scenario for our current lives or future. As we project these dreamlike visions from the deepest reaches of the mind, we are putting out an energy into the cosmos, and subsequently the universe arranges itself to match the frequency that we project. That doesn't suddenly teleport one to the French Riviera while sitting in a cubicle, but it often brings about synchronicities in various arrangements, or opportunities that seemingly match the feeling or resonance of our imaginal wanderings. This Summer presents us with bountiful opportunities to bridge our visions with reality. As the Sun enters Cancer on Summer solstice, it is slowly entering into a water grand trine with Saturn in Scorpio and Neptune in Pisces. Saturn in Scorpio, as intense and penetrating as it's been, is also about solidifying our desires in practical and pragmatic ways. When combined in harmonic accord with Neptune, we have the chance to bring those truly transcendent, abstract, and numinous visions into tangible constructs. That means different things for different people--but whatever it means for you, look for ways to make something happen, something you really wanted but never believed was possible for you. Hold that vision this solstice, make it as clear and visible as possible; really believe in your ability to bring it about. While we do this, we must also be conscious that we're dealing with Saturn, and that means that we can't exactly take any shortcuts; but if we're willing to put in the hard work and effort, and are equally willing to trust in the power of the universe to assist us, we have an amazing opportunity to go really far. You may even find yourself feeling a little invincible, or just more capable and confident to carry something out that you may only have dreamed about before. Trust in yourself and consciously work to support your desires to make truly lasting changes for your future. This is a delicate balancing act that requires allowing ourselves to dream, but to equally condense and distill our visions into practical and applicable forms. 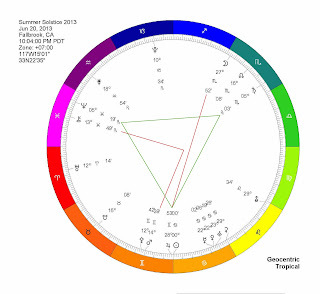 Just before the Summer Solstice, on June 19th, the Sun and Jupiter conjoin at the 28th degree of Gemini. The Sun conjoins Jupiter every year, but this particular conjunction is really quite unique because it occurs at this highly significant degree of Gemini. In addition, it is also an occultation of Jupiter, which means that Jupiter will actually pass behind the Sun. We could say that Jupiter gets literally swallowed by the Sun, and these two fiery wanderers fuse and melt together, momentarily merging their identities. As two of the largest bodies of our Solar system are coming together, we can anticipate this feeling of immense grandiosity occurring within us and especially within the mind-field. Occurring at the anaretic degree of Gemini, we must be conscious that we don't mentally burn ourselves out in the process. What is occurring here is a powerful merging of possibilities--a sort of multidimensional crossroads. It feels as if quite a bit is coming to a boil, things that have been brewing and stewing for quite some time. This is a critical turning point, pushing us to condense a lot of material into something more manageable and simplified. The word solstice literally means sun stand still. This is because as the Sun reaches the Summer solstice it's literally moving higher and higher from the horizon; as the Sun reaches this climax mid June it stops ascending and begins descending toward the Autumnal equinox. The opposite occurs during the Winter solstice. With Jupiter and the Sun melding together, and the Sun slowly reaching its high point of the year, we will also experience this peak effect in our own lives. What is peaking for you now? What high point have you come to? We are expanding and blossoming into some potential within us. That means that this energy is about to explode like a miniature big bang, and all the scattered bits and pieces will eventually organize and coalesce into some truly extraordinary formations as the Summer progresses. So what are you wanting to expand yourself into? Let yourself dream, but also be practical so that you don't go out too far, fragmenting yourself, unable to bring it all back in. In the solstice chart there are five main points of interest. These will be subtle themes that will get carried out throughout the next three months. The first is the Jupiter/Sun conjunction I described above--adding expansiveness, optimism, and a culmination of ideas into our own individual process. The Moon in Scorpio inconjuncts this conjunction--which means that while there's this big thing going down on the surface attracting most of our attention, we mustn't lose sight of what's going on behind the scenes, in the shadows. Personally that means having to make compromises between inner and outer needs, visible and invisible realms. Mercury, Venus, and Vesta are conjoined in Cancer adding an intense focus upon something that we're really passionate about, something that supports, sustains, and nurtures our soul. The Sun/Jupiter conjunction forms a water grand trine with Neptune and Saturn--urging us to allow the creative force of the universe to work directly through our minds to bring about tangible creations through discipline, surrender, and an intuitive awareness. Lastly, Mars and Athena in Gemini square Chiron in Pisces. This provides a tremendous drive and passion to uncover the truth behind the wound, whatever that is for you. Through research, logic, and a dissemination of information, we have the potential to discern the reality of some area of pain for us--by using the power of the intellect to uncover the truth of its origins to ultimately create a strategy for a healing process. In addition it pushes us into a sort of multidimensional awareness of reality; there is tremendous impetus and desire to unlock a perspective of our surroundings that we don't perceive with our usual senses. On the collective level, this challenges us to look at events from a perspective that transcends the limitations of pure logical analysis and to see our world through a more complete holistic picture. If we really go with this, we will strengthen the connection between the mind and higher faculties. In addition to the personal changes we're all experiencing, we are going to witness some truly remarkable historical and political events on the world stage this Summer, many of which are already in the works. This is because the configurations occurring right now have been shown to correlate throughout history with truly significant cultural shifts and turning points. Without pointing to anything specific, I will just say that what we've witnessed so far in the media is really only just the beginning of something that is building up. This Summer is really a kick off of events that will unfold over the next few years. This is all being led and directed by the Uranus/Pluto square, pointing us all, ideally, toward social change and cultural reformation. As we navigate this Summer just keep in mind that you have more power than you think; trust in yourself and in your ability to step up and take charge of your life. There will be a lot of strong emotional and sensational currents surrounding us; but we must be conscious enough to resist the temptation of getting swept up and losing our sense of individuality and identity. The biggest challenge this Summer is to allow yourself to expand into several directions to ultimately obtain a more comprehensive experience and awareness; but again, to remain aware of the tendency of going too far out and getting lost and fragmented. Uranus in Aries is a powerful focal point urging us to have a clear and direct intention so that we can properly distill our energies and channel ourselves into very specific aims. Our most powerful ally will be our inner voice and intuitive awareness. The water element is really speaking loudly, drawing our attention toward the more subtle and impressionable aspects of consciousness. Trust in your power to lead and have faith in the innate intelligence of your inner voice and gut instincts. The astrology this Summer is truly supportive of bringing some incredible shifts into our personal lives, and with the right determination, intention, and focus truly great things will be within our reach that are otherwise less available.